A logbook loan is a loan which is secured against your car. Which means that until the loan is paid back in its entirety, the car (or other vehicle) belongs to the lender. This is usually achieved by transfer of the V5 document, commonly referred to as the logbook, to the lender, until the loan is repaid. Logbook loan companies rely on the Bill of Sale Act 1878 which means that when you take out a loan your car becomes the property of the people lending you the money. Interestingly, this law does not apply in Scotland, though many companies offer a loan which they may call a logbook loan - even if they do not become registered keepers of the car. How much is the interest rate on a logbook loan? How much can a logbook loan be for? A typical logbook loan is for around 70% of the value for the car - so a car with a market value of £10,000 could yield a loan of around £7,000. Most lenders will accept any make, model, or age of car (with a lower value of around £500), while some others might be a little more restrictive. One key fact to remember about logbook loans is that the debt is attached to the vehicle, not the person taking out the loan. According to HPI Check, an incredible 1 of every 4 cars checked by them still has finance outstanding, and a simple finance check can cost as little as £3. The simple rule to follow when buying a car is: if there is no V5 document, there is no sale. If a car is bought that has outstanding debt, the lender has legal right to repossess the car, meaning you’ve not only paid for the car, but for the loan as well. Yes, but always check that the company is at least authorised and regulated by the FCA. While it can be difficult to imagine the frustration at having bought a car and then having is repossessed, The Law Commission said in 2016 that new legislation is needed to make it a criminal offence to sell on a car that has outstanding debt. But until then, it is always best to check when buying a car, and be safe rather than sorry. Most lenders request that transfer of the V5 document is done before the loan amount is paid. From this point, until the V5 document is transferred back (after the final loan repayment is made), the car belongs to the lender. The person taking out the loan can still drive and use the car as normal, but the lender would be entirely within their rights to repossess the car if the loan payments were not maintained - and they don’t need any permit or warrant to do so - except serving you a legal notice (as required by the Consumer Credit Act 1974). If the sale of the car does not cover the cost of what's left on the loan, the borrower will have to pay the shortfall, but even worse, lenders can charge a fee for this, causing further debt. 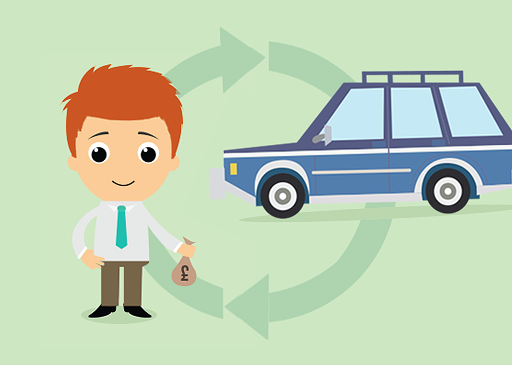 Though a benefit of logbook loans is pure convenience and speed of payment, especially if a borrower has a poor credit ratings, there are alternatives which may be cheaper. Credit unions are one option, but even payday loans (at least over shorter terms), or guarantor loans can have lower amounts of interest repayable. Who offers the best logbook loans? Logbook loans are an expensive form of borrowing, but if you’re still considering using a logbook loan for your next loan, read our logbook loan reviews first to see what people like yourself are saying about companies like Varooma, AutoMoney, and Mobile Money. Compare our logbook loan reviews to help you find the best, and avoid the worst logbook loan companies!